The Ancient Materials Department handles historical sources from earliest times to the first third of the fourteenth century. This department compiles and publishes these sources chronologically in Part I-V of the Dai Nihon Shiryo series. 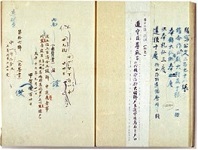 In addition, the department investigatesthe oldest archive, which is extant in Japan, the Shosoin Documents, and publishes its inventoryin the Shosoin Monjo Mokuroku.